"No matter what your level of woodworking, if you like to build Arts and Crafts furniture, you'll like this book. Lang has taken photos from old Stickley catalogs, scaled them, and then produced working drawings and cutlists. The book also offers a brief history of the style and how-to information for the most commonly used Craftsman techniques. Lang has produced three more books in this series. Below are some excerpts from reviews of "Shop Drawings for Craftsman Furniture". "Here’s a "must-read" book for any woodworker interested in building Craftsman” furniture, . . .Another nice feature is Lang’s primer on how to read and interpret drawings. You may find this section to be an education in itself if you’re not fully conversant with drafting conventions. . . .The main attraction in Lang’s book is the drawings themselves, although there are enough juicy morsels of information to interest woodworkers of all abilities. With this book, a pile of white oak and a long winter to spend in the shop, you could easily outfit a good sized home with authentic Craftsman-style furniture. "I've been collecting and building Arts & Crafts furniture for more than a decade now, and I've been waiting for this book for about that long. In fact, it's a wonder that no one has written these books until now. Author Robert W. Lang essentially presents you with the keys to the castle: 30 shop drawings of some of the most well-designed Craftsman furniture from this important artistic and cultural movement. You get measured drawings of the plan, profile, and elevation (usually called a three-view in design circles) and at least a couple exploded 3D drawings. Plus there's a cut list. Intermediate woodworkers will be able to go straight to work. For the beginners, there's a section in the front of each book that explains basic construction techniques. However, first-timers would do well to get a couple simpler projects under their belts first." "At first glance, this book looks like just another survey of Arts & Crafts furniture. But it doesn't take long to realize that what Lang has given us is a very detailed shop manual, designed for intermediate to advanced skill levels, and written by a craftsperson who understands the subtleties of Stickley's groundbreaking designs. This collection of drawings for Craftsman furniture is a must-have title if you like the style. We'll always have a soft spot for furniture designed in the Craftsman style. That's because POPULAR MECHANICS is a 100-year-old magazine, and we were early advocates of the style and published books and articles when the furniture and architecture were in their prime. We were young once, and so was Craftsman furniture and the houses bearing Craftsman design details and proportions. That's why we especially like this collection published by Cambium Press. It's an extensive assemblage of Craftsman pieces by draftsman and cabinetmaker Robert Lang. The 144-page book has a knowledgeable introduction that cover's the style's hidden secrets, its construction details and joinery. The text provides the kind of insight that can be had only by someone who has built this stuff. The book has sufficient variety for anyone who likes this style of furniture. It contains plans for beds, case pieces, chairs, benches, stands and bookshelves. Perspective views and elevations are included. You get a clear look at each piece, and then you can take it from there. MORE Shop Drawings for Craftsman Furniture is an excellent and thoughtful work. 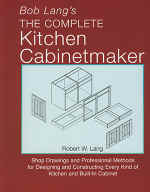 Lang's book provides both context and measured working drawings for many of the Craftsman-style architectural elements found in typical bungalow homes, including moldings and trim, doors and windows, kitchen cabinets, built-in cabinets and bookcases, bedroom and bathroom cabinets, fireplace surrounds and staircases. in many cases, Lang has made the drawings more relevant for modern builders and renovators by showing the use of plywood and other modern materials and construction methods. The most obvious case in point is his treatment of kitchen cabinets. After detailing original turn-of-the-century cabinets, Lang provides us with drawings of the modern equivalents, with standardized countertop and cabinet dimensions, in both face-frame and frameless versions. An informative introduction to the kitchen chapter, complete with original photos and illustrative key drawings, explains Lang's adaptations nicely. All the drawings in the book are based on AutoCAD originals. They are crisp and clearly dimensioned and include all the detail you need to recreate authentic replicas of the original woodwork. It is a must-have source book for anyone interested in building or renovating a Craftsman-style home. SEND E-MAIL AND LET US KNOW WHAT YOU THINK! "Just wanted to let you know that I received your book. I have not read it cover to cover but I have skimmed in depth and love the material. Thank you very much for a great book. It must be very gratifying to be able to publish something of this quality." "I sure have enjoyed your first book. I’m looking forward to receiving your new book and the plans. I have been wanting to build the Ellis bookcase for quite a while now and finally have the time to do it...right after I finish those 10 other furniture projects! You know how it is. Anyway, thanks for catching my goof and keep up the great work with all the books and plans"
"You do great work Bob, and there's no better instruction on the design and construction of Arts & Crafts and Craftsman/Mission furniture! We're all extremely fortunate to have you and your publishers! Keep it up and keep in touch." "The introduction to the book was an eloquent and informative turn on the Stickleys, their style, and wood craftsmanship." "I ordered your book on Friday--it arrived today! (How's that for speed?) Anyway, just wanted to thank you for the (autographed!) copy. I'll definitely be ordering vol. 2 when ready (if you're keeping a list of prospective purchasers, please put me on it and let me know when it's ready via email. I've made quite a bit of craftsman furniture in the past, some from the, Bavarro book, some from the (sparse) measurements given in the Craftsman, some just by eyeballing the pictures. It's always a bit of a chance whether something will turn out as it appears in the mind's eye. Your measurements improve that chance by a quantum leap." "I purchased your book a few months back. I really appreciate your effort & work to produce such a book. It is also reassuring to know that these are drawings based on originals. Your book will certainly become a classic reference material on an important historical period, at least for guys like me, the builders. Is that enough brown nosing? Seriously, a nice little body of work, thanks for doing it.